Editions Xavier Barral, 9782915173703, 118pp. Jabba the Hut lurks in the shadows of a decrepit, abandoned warehouse, his toady eyes glowing; Boba Fett looms up from the fluorescent glare of an indoor car park, poised to kill; Yoda peers out inquiringly from the window ledge of some otherwise untenanted institutional building; Han Solo's cryogenically frozen form on a slab stands, installed bizarrely in an anonymous concrete plaza. Of the many scenarios to which Star Wars fans have dispatched the films' protagonists over the years, none--not even Seth McFarlane's Family Guy homages--are as unlikely as C dric Delsaux's. 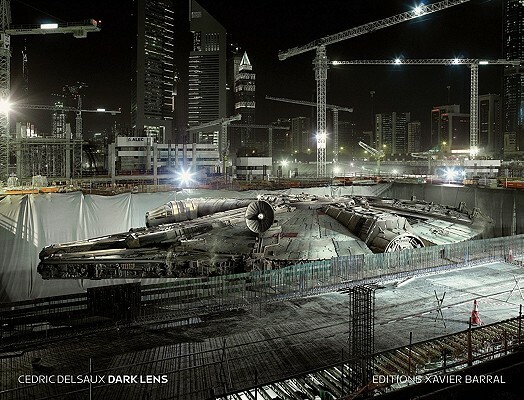 In Dark Lens, Delsaux transports Darth Vader and the whole gamut of Star Wars iconography to a post-apocalyptic, urban-suburban landscape of endless parking lots, highrises and wasteland interzones, vacant of ordinary human life. Delsaux's "mythology of banality" (as he describes it) produces images that are not just funny or preposterous, but also weirdly compelling; in their photographic plausibility they successfully incorporate Star Wars into an everyday reality that we can all recognize, but in ways that make both worlds seem strangely real and absurdly false. Delsaux's Dark Lens will captivate both film and photobook fans alike with its fantastically bizarre recasting of Star Wars on planet Earth after the apocalypse.